Antique - Mason's Patent Ironstone China, Chop Plate Style, Pattern C3859, Made from 1891 thru 1920. This is a beautiful Dinner, Chop, or even Decorative Plate made by Mason's Patent Ironstone China. It has a center well with Multi-color Jacobean Floral with Reds, Yellows, Blues, Purples, and Greens.. With the same Floral Pattern on the Lip of the Plate. A Yellow Band is at the Rim, with Cross-Hatched done in Black. A very dramatic pattern in bright distinct colors and flowers. Great condition for its age. This is a beautiful Dinner, Chop, or even Decorative Plate made by Mason's Patent Ironstone China. 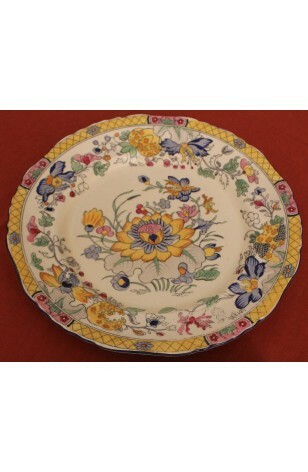 It has a center well with Multi-color Jacobean Floral with Reds, Yellows, Blues, Purples, and Greens.. With the same Floral Pattern on the Lip of the Plate. A Yellow Band is at the Rim, with Cross-Hatched done in Black. A very dramatic pattern in bright distinct colors and flowers. Very Good Resale Condition for its age..
1 - Chop Plate - or could be used for Dinner, Decorative, etc..